Want to Use SignUp.com School-Wide? Our Campus Plan is for you! 1. What is included in the Campus Plan? 2. How do I get the Campus Plan for K-12 Schools? 3. Do we need the K-12 Campus Plan? 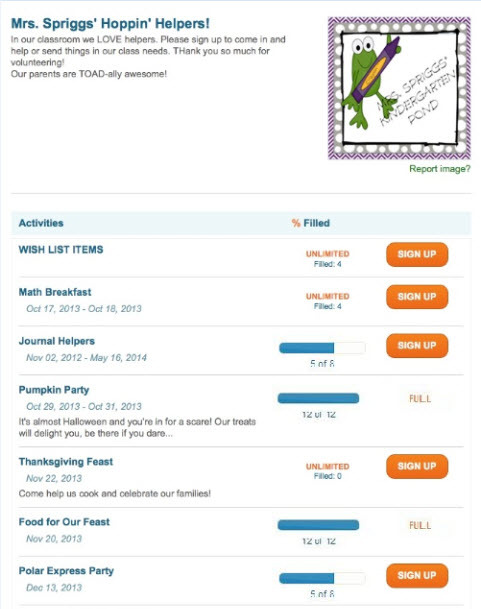 For schools or parent groups wanting a more centralized approach, our Campus Plan makes it extra easy (and cost-effective) to share planned activities, post SignUps to common School and Class Group Pages, and track parent and volunteer participation across Signups. Compare our free and Campus plans here. 4. Should I put all my needs on one SignUp calendar? You CAN put all your school SignUps on one calendar but we do not recommend it. Schools typically have many different people organizing SignUps (teachers, committee chairs, room parents) and parents will respond best to specific targeted requests to participate. For example, you may wish to invite all the parents to volunteer at the school carnival or bring food for the welcome potluck, but for scheduling class readers or parent-teacher conferences, each teacher will invite his or her own class parents. For more examples, please see this article: How should I set up my school with SignUp.com? 5. What if I want parents to access all our school, grade or classroom SignUps in one place? 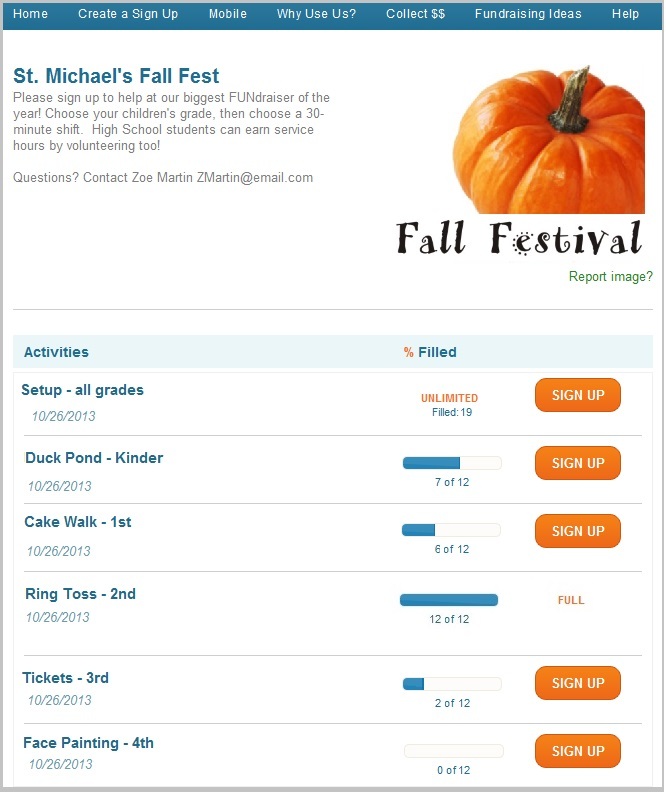 Second, your individual organizers (parent leaders and teachers) can quickly provide a Shareable SignUp Link to each activity. These links (or formatted SignUp buttons) can be easily posted on your school’s web page, Facebook page or any eNewsletter. We also offer calendar sync of multiple SignUps to an embedded Google calendar on your website - Learn more here. 6. Can we transfer our Premium membership from one organizer to another organizer? It depends on the length of your Premium subscription. For Campus Plan and one-year Premium subscription holders, we can transfer the Premium upgrade to a new organizer email address quickly – please send us a request to support@SignUp.com. For monthly subscription holders, please cancel your next month’s service and have the new organizer upgrade their own account. For more information on how best to set up your school with SignUp.com, please see this help article: How should I set up my school with SignUp.com? How do I upgrade my account with the Campus/Organization Plan Promo Code?